Pork belly and braised cabbage. You might be thinking, “Really. Out to dinner two nights in a row?” Believe me, it’s not the norm. But after having moved to the neighborhood, J and I feel a responsibility to contribute to Alberta Street’s success. And if that means eating out two nights in a row, so be it. It had been a few months since we visited del Inti, our neighborhood Peruvian bistro, and we could not stand the guilt if, god forbid, it closed its doors. Not that it needs our humble contribution. By the looks of the steady clientele, this spot is a local favorite. Del Inti’s welcoming patio with its piped-out Latin tunes and roaring fire pit mark the spot on Alberta and 23rd. Inside, the open space contains a bustling exposed kitchen, a lively dine-in bar, and a comfortably spaced dining area. Colorful artwork, globe lighting, cork flooring and a garage-type door that opens from the bar onto the patio complete the sleek neighborhood vibe. A half-dozen colorful ceviches open the menu, and choosing presents a challenge. We selected the ceviche mixto with cubed mahi, whole shrimp, thin-sliced octopus, red onion and a fiery rocoto leche de tigre sauce, all capped by a jaunty dime-size slice of habañero. Sweet potato provided textural contrast and cooled the palate. 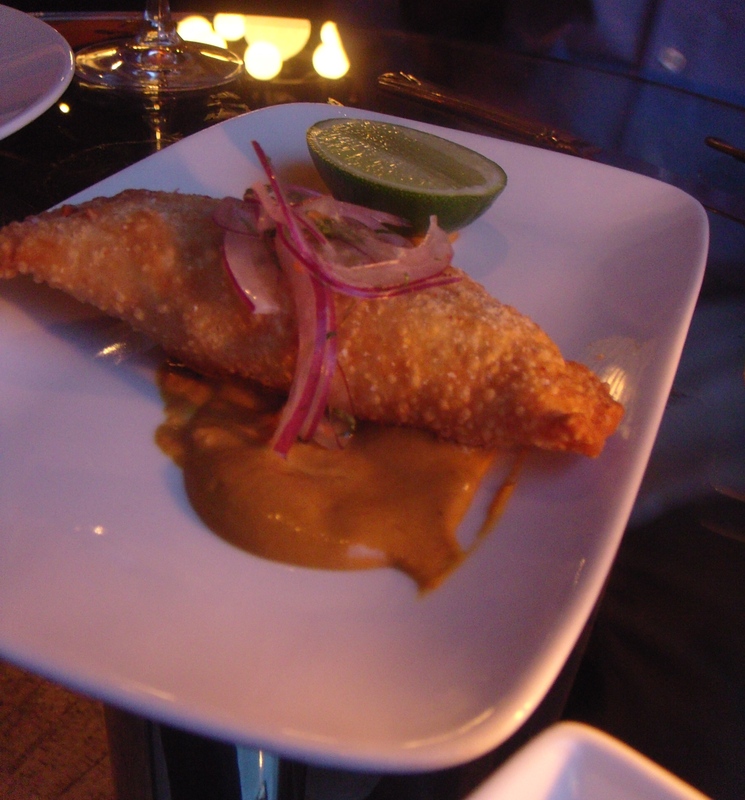 From the small plates, we chose the empanada, a flaky, deep-fried turnover stuffed with beef, potato, raisins and olives served atop a mild, nutty ocopa sauce. Next, the “chancho,” a pork belly confit, crisped top and bottom, served atop braised purple cabbage and finished with crunchy green apple chimichurri. 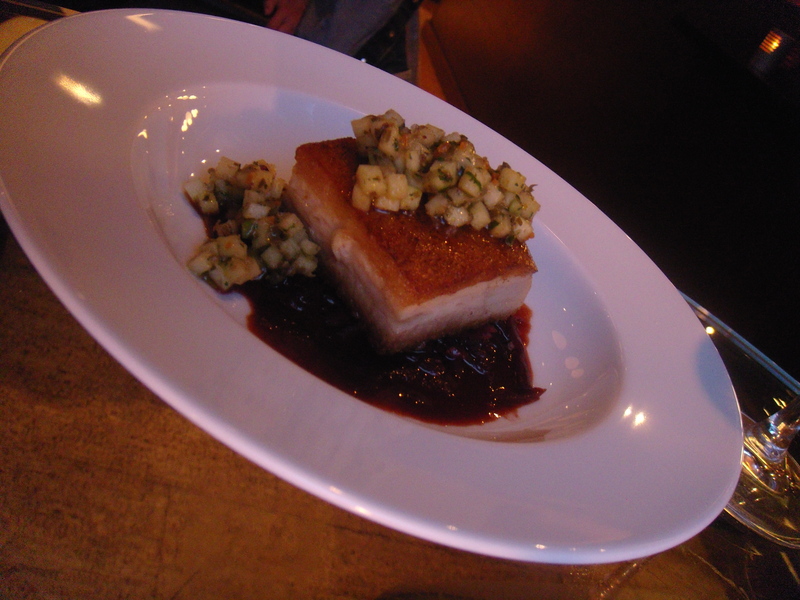 The cabbage and apple provided sweet-tart crunch to contrast the salty pork, which disappeared on the tongue. Beautiful. For entrees, J’s soy-glazed hangar steak cooked to a tender, pink medium rare, complemented by portobello mushrooms, fried potatoes and rice. For me, a pan-roasted corvina with manila clams, pork sausage, tapenade alongside buttery carrot “pasta” cut into pappardelle-like ribbons, cooked to al dente. All delicious. Apple crisp with carrot-lemon ice cream (yep, I said carrot and lemon) rounded out our Saturday night meal, and we walked home, satiated and so grateful to be living in this neighborhood. Del Inti, you continue to surprise us with your flavors and unexpected contrasts. Nos gusta mucho y hasta pronto. 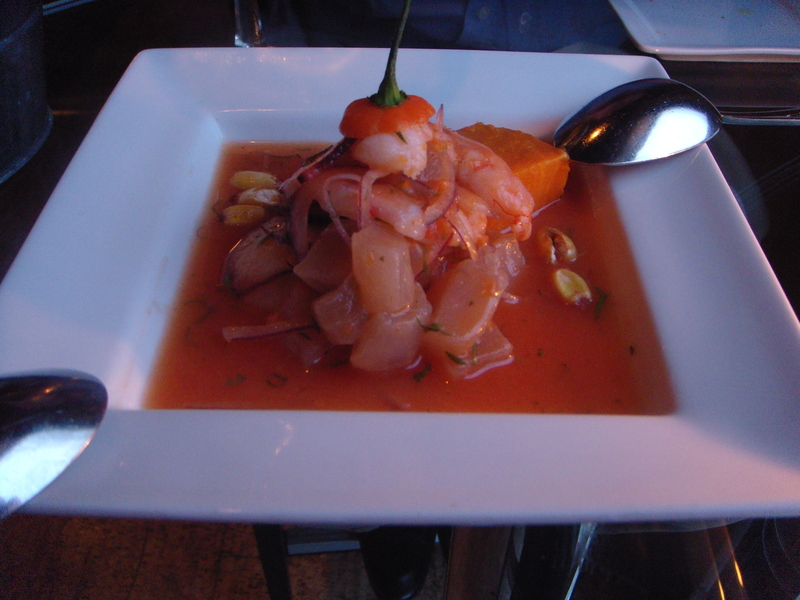 Ceviche mixto with a habanero hat. Empanada, perfect with a squeeze of lime. I really like the small plates menu idea. For me – its the perfect way to try many flavors. Yes, I agree! We could have ordered a bunch of small plates, and we would have been perfectly happy. Great flavors, here.